Traveling to Mallorca at age 15 - Viva Espana! 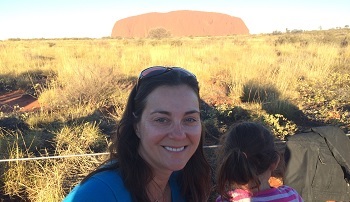 Australia on a family vacation - we visited Sydney, Ayers Rock, Alice Springs, Port Douglas, Green Island, Hayman Island, Hamilton Island & Melbourne. Without a doubt Australia, my passion started in 1994 with my first trip down under which subsequently led me to moving there to live for a year as part of a working holiday visa. Australia is known as the "happy country" and the outdoor lifestyle, dramatic landscapes and friendly people are something to behold. My kindle, support socks & lots of water. Be sure to book all your flights on one ticket - that way you get the best connections, mimumum down time and are completely protected if something goes wrong. We often have situations where tickets were purchased separate to each other to save on costs but ultimately any small saving was not worth it due to the additional time wasted and stress that can be added. Always arrive at the airport early so you are relaxed and checked in. Once on the plane take advantage of the entertainment systems to pass the time quickly - the choice on our premier airlines is amazing. If you can stretch to premium economy or business class you wont regret it - these classes give you more chance of a good sleep allowing you to feel more refreshed on arrival. There are so many favorites but if I have to pick one I'll choose Queensland - the options are limitless and really getting to the crux if a client is looking for an Island or mainland stay, what type of Great Barrier Reef experience or time in the Daintree Rainforest is really satisfying as there are so many options and these are the types of situations detailed destination knowledge shines through. Snorkeling or diving on the Great Barrier Reef is a bucket list trip for most of our clients and the reality is never disappointing. As a sagittarius I naturally love to travel and have done independently from a young age - I cannot imagine a life without discovering new destinations & traveling regularly. Like most things in life you can probably do it yourself but would you get the best result? Absolutely not. We are often asked how the travel industry is for agencies such as ourselves as many people assume everything is booked online these days, destination specialists are bucking this trend - just because you can book a hotel or flight online doesn't mean you will book the best option, its far better to consult with an agent who knows the country intimately, has road tested the hotels, airlines and tours and can make recommendations based on your interests and budget. When you are traveling to the other side of the world using your precious vacation time & spending a considerable amount of money you want to ensure you get the absolute best trip ever! Hearing from a client when they have just returned from their trip - I love to hear all feedback and how the trip was the best honeymoon they could have wished for or the best family vacation.